What? Politicians selling their morals out for more money? Doing unethical things for profit and votes? Say it ain’t so! Drivers suspected it was happening. It’s not new, either. Cities and towns have been doing it for years to fill their coffers even since traffic lights have existed. The difference is that it’s even EASIER for them to collect because they don’t even have to have a police officer there to make the stop. Of course, many cities are finding that they’re not getting as much money from these cameras as they thought. Meanwhile, the companies who own the traffic lights have made a killing! However, at least Pueblo, Colorado says they’ve seen behavior changes. On the other hand, most studies show that red light cameras INCREASE ACCIDENTS. Here’s a summary of five different studies showing just that connection. The common sense solution to red light crashes in the past was to lengthen yellow lights to enable cars to clear the intersection before the other cars were given a green light to proceed into the intersection. There is increasing evidence that these yellow lights have been shortened (as in Chicago), CAUSING MORE ACCIDENTS in the search for more traffic ticket fines. It’s tough to find anyone on record to actually say that’s an official policy (as it’s highly unethical and illegal.) However, it’s a bit too much of a coincidence to put the pieces together and simply chalk it up to chance. And just today oddly enough, a new court ruling came out challenging the legality of privately contracted red light cameras! 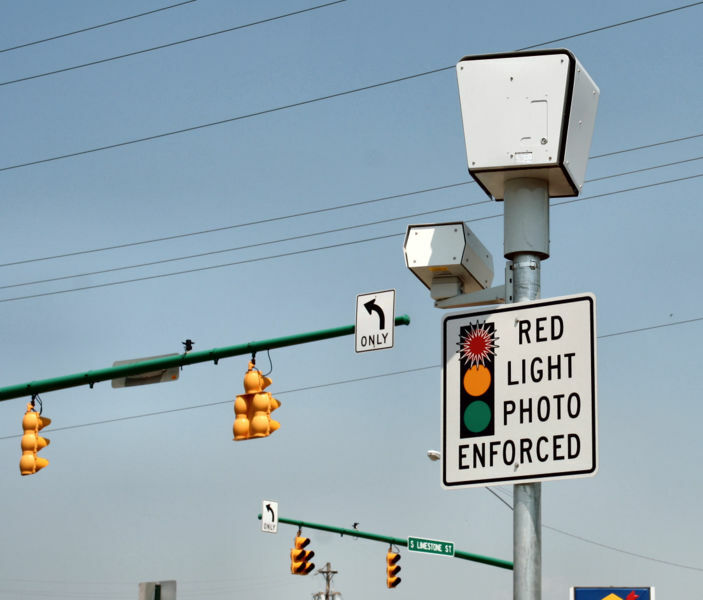 Nine states already ban red light cameras. Big brother can change the rules anytime it wants.